Submersible identification bar light for over-80” applications. 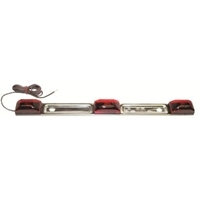 Stainless steel bar is corrosion-resistant with three sealed lights. Pre-wired with 60” lead wire; grounds through mounting hardware. Mounts on 8 1/2” centers. Available in red.